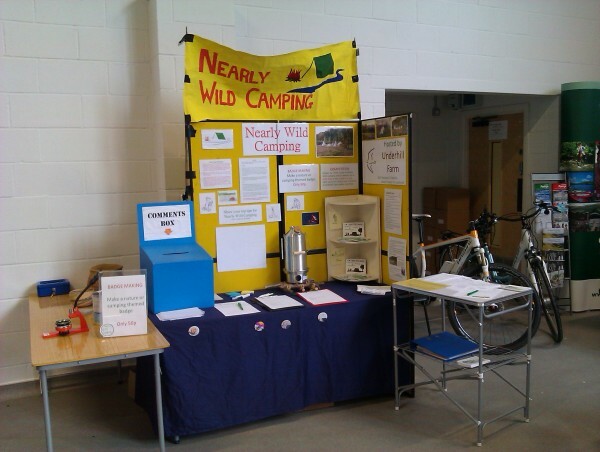 The Nearly Wild Camping team are now back and recovering from a whirlwind weekend at the Welsh Smallholder show. It was wonderful to talk to so many enthusiastic people, confirming that there really is a demand for Nearly Wild Camping from both campers and smallholders. We talked to people who were veteran wild campers, who were interested in being able to visit a wider range of places and not to have to move on first thing in the morning. And then we talked to people who had never camped before, but were really taken with the idea of having the experience of camping in wilder places. We talked to smallholders who wanted to share their little bit of wilderness with others and those who were struggling to make a living from the land and welcomed another income stream. As well as those with bigger farms, who realised this could be a good use for some of their out of the way awkward land – difficult for farming, but perfect for nearly wild camping! We also talked to some organisations who thought that their members might be interested in getting involved. What about being able to visit some of the farms who are part of the Calonwen cooperative?! I know I would be really interested to go and check them out. We had lots of campers and smallholders who want to get involved in this summers trial, so we will be getting everything together this week, once we have properly digested all the interesting conversations and feedback we have had, ready to get the trial up and running.